Learn all about bath linens, including shower curtains, towels, bath mats, and bathroom curtains. Explore the world of bath linens. Necessities like shower curtains, bath towels, and bath rugs or mats offer much more than function; they offer a chance to express your decorating style and dress up your bathroom in beautiful way. The selection in modern bath towels, curtains, and rugs offers everything from everyday basics to highly-detailed luxury items. Enhance or create a bathroom theme with linens ranging from cute to rustic to elegant. Shower curtains are available in a wide range of styles such as, designer, retro and novelty. You might be surprised to discover you can buy extra long shower curtains and extra wide shower curtains. The right shower curtain can transform your bathroom from plain and ordinary to exciting and fun. Take advantage of the various sizes of towels to create interest in your bathroom design. Roll Turkish hand towels or other luxurious towels and place inside a basket for special occasions. Decorative and designer towels add a splash of style and color in your bathroom. You can use matching bath rugs and towels or choose a patterned bath mat. 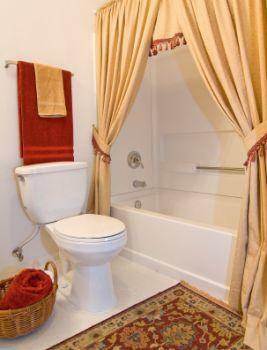 Select solid-colored towels to complement the colors in your bath rug. Bathroom curtains can offer more than privacy. Select curtains that will match your other bathroom linens. This category features wide selections of bath linens available to you. You may discover new styles for your bathroom makeover or new bathroom. Become part of this growing community by leaving a comment to share your thoughts and ideas with visitors.